Can dogs eat Cheez-Its? There are better alternatives! Vet approved! Cheez-it crackers are a crunchy, salt treat for humans. Tossing one or two to your pup may not hurt them, but we should avoid feeding them to our dogs on a consistent basis. The salt, dairy and fat content of the Cheez-it doesn’t really supply your dog with any nutrients or necessary vitamins. Cheez-it is junk food and giving some to your pooch can certainly mess with his appetite especially during mealtime. 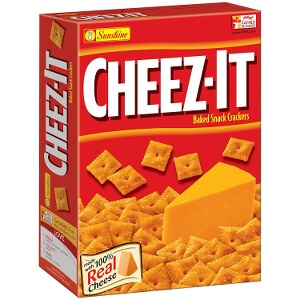 Considering that there are several variants of Cheez-it, check the list of ingredients closely to make sure that it does not contain anything that is harmful to you pet, such as onions, artificial flavorings, and food coloring. What is wrong with salt, dairy and fat? Dogs typically consume enough sodium in their everyday kibble, especially when you’re giving premium quality pet food. Treats, which are high in sodium could pose long-term problems to your pooch’s health; salt poisoning in dogs can vary from moderate to life threatening. If your puppy eats too many Cheez-it’s, or starts exhibiting symptoms of salt poisoning, such as vomiting or diarrhea contact your vet right away! In the wild, it is unlikely your dog or his ancestors would encounter the opportunity to drink milk or milk-based products. Predictably enough milk is a key ingredient in the Cheez-it cracker as it is used to make cheese. This milk-based product can upset your dog’s digestive tract leading to diarrhea and vomiting. Additionally, dairy products can cause allergic reactions, which may manifest as itchy skin. As usual, you should always put Fido’s safety first whenever possible. If your dog has symptoms of a food allergy or sensitivity after eating Cheez-it’s please let your vet know immediately. But if you really think about it, why should you risk your pet’s health and wellbeing by giving junk food? Still, Cheez-it crackers are an enviable snack for your dog. While you treat yourself, consider treating your canine companion with more nutritious snacks. How about your dog and Cheez-its? Any alternatives you feed instead? Please share in the comments.